[By Nick, New for Spring 2016] Hello Second Scoopers! The reports of my death have been greatly exaggerated. Nick here and I'm alive and well. It's just been a crazy time in my life. I got engaged, I have a baby boy on the way, I'm making my own ice cream and making some amazing donuts at Cider Belly. Oh and yeah, I'm in my last year of college. So. Much. Stuff. Whatever, I'm back and I even have a fancy new iPhone to take photos with seeing as my real camera went missing in action. So onto the latest blizzard from Dairy Queen. Oh yeah, we now have a DQ in my area. You all remember the epic s'mores blizzard? Well it now has a sibling and DQ wants you to choose a side. Now I never had the s'mores blizzard before but my fiancée ordered it so I could sample it. I can confidently say the Oreo version is far superior in my book. The s'mores blizzard on its own can be a bit cloying. The marshmallow gets a bit too sweet and there just isn't enough chocolate in it. The addition of Oreos makes up for that and more. The blizzard tastes exactly like what smoreos, I mean s'mores Oreos, should've tasted like. The graham crackers and Oreo wafers work well together. Neither one dominates the other and work well to add an awesome chocolate graham flavor profile. 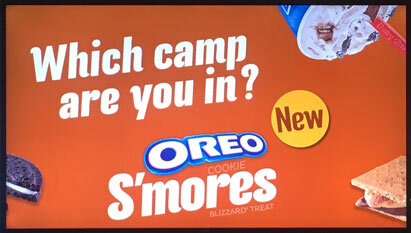 The marshmallow sauce is sweet but with the added Oreos, it's tempered by the bitterness of the cookies. This might possibly be the perfect blizzard. Or at least the perfect blizzard for me. I don't even like soft serve but I'd easily get this one often. I'm choosing the Oreo side in this fight. 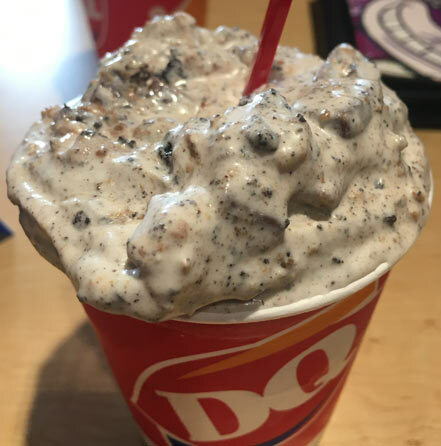 Head on over to your local DQ and decide for yourself! Dubba's Note: Just for the record, I tried picking this up as well but we picked the wrong time to go because all three of our blizzards were not well made. It was ok, but not as good as it should have been. As always, your DQ mileage will vary greatly. Congrats Nick!!!! So much excitement. As someone who has been there and done all of that, I urge you to try to live in the moment and savor it all. Everything is going to move so fast and if you don't slow down it will all be just a memory before you know it. Pay attention to TODAY, everyday! All the best!!! Are you going do a review on sour patch kids ice cream? Thanks for the review Nick. My DQ just opened for the season, and I def am gonna give this one a shot! Anon: Thank you very much. Everything feels like it's going super fast and taking forever at the same time. I'm very excited though! Alek: I don't like sour patch kids normally so that's a no. Danielle: no problem, let us know what you think! I miss the Royal shakes. The original S'mores royal shake was my favorite DQ item of all time, and I think the Oreo version just might top it. When the Royal shakes were around, DQ employees could make any Blizzard into a shake. Now they refuse to do it because there's no established price. My DQ visits dropped from near weekly to rarely if ever when this tragedy occurred. And Aleksandr Rozentsvit, the Sour Patch ribbon ice cream is solid, but the marshmallow ice cream has a bit of an off. yogurt-y, flavor to it. Could be an all-time great with a better marshmallow, or simply the raspberry ice cream with marshmallow and sour patch ribbons. I love the temperature Baskin serves their ice cream at, it makes the texture and creaminess of their ice-cream the best in the game. Not sure why nobody else can get this right, soft-serve notwithstanding.